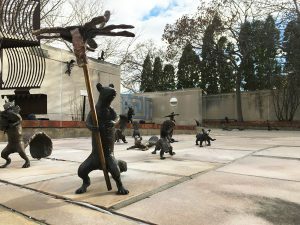 Artwork by three of Nebraska’s most prominent sculptors, Catherine Ferguson, Charley Friedman, and Jun Kaneko, are featured in the MONA Hillegass Sculpture Garden. At the entrance, viewers are greeted by a ceramic, larger-than-life, black and white ‘head’ sculpture by world-renowned ceramicist and Omaha-based artist, Jun Kaneko. This work is on loan from Clay and Beth Smith of Lincoln, Nebraska. Flanking the entrance into the Museum is Catherine Ferguson’s Aida (Nile Act 3), three sky-blue metal totem-like forms inspired by the opera Aida (for which the artist created the stage design and costumes). Ferguson created this new sculptural installation for this current exhibition in the Sculpture Garden Series. In the southeast section of the Sculpture Garden, Charley Friedman’s bevy of life-size bronze squirrels armed with nuts, berries, and carrots are moving northward with a collective mindset, seeming to be ready to infiltrate the landscape. Squirrel Gang is on loan from Paige Duncan and Jonathan Henning of Lincoln, Nebraska.